One of the topics we’ll be exploring in the upcoming 20th Century History exhibition will be the impact of First World War deaths on New Zealand society. More than 18,000 New Zealand soldiers died overseas during the war, but very few of their bodies came back, so the way in which their sacrifice was memorialised was very important for their family and friends back home. All over New Zealand, communities responded by building memorials to their local dead: more than 500 statues, obelisks, arches, civic buildings, and other monuments were dedicated to their memory. We’d like to commemorate the spirit behind these memorials by asking communities of today to photograph their local World War One memorials. We will then present these photos – as a large-scale slideshow – in the 20th Century History exhibition. If you’d like to contribute a photograph of your local World War One memorial to the exhibition, it’s easy. To make the memorials look their best, the images need to be high-resolution (the minimum is 1024×768 pixels; more would be even better), in portrait format, preferably on their own, without people (though you’re welcome to send us lots of other kinds of shots as well). The photo above is an example of what we’re looking for. You can find your local memorials listed on nzhistory.net’s Memorials Register. And if you know of a World War One memorial that’s not on the register, please let us know. We’ve created a group dedicated to the World War One Memorial Project on the photo website Flickr. More information about the Project can be found there, along with other examples of the kind of images we’re looking for. You can post your photos on the site and tell us about your experience of taking them. The forums attached to this Flickr group can be used to organise your photo session with other people in the area. You can also get in touch with your local RSA for information about local memorials and Anzac Day activities. Although Anzac Day is a great time to memorialise your memorial, you can take your photo any time. At the end of April, we’ll let you know how it’s gone and what memorials (if any!) we would still like photographed. EDIT: The World War One Memorial Project is now closed. Do you think it’s Glover as opposed to Clover? 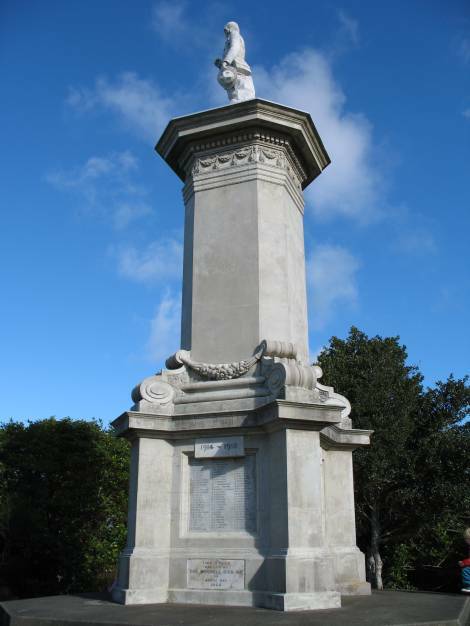 Glovers are suspected of carrying out the work for Aro & Makara Memorials from reading NZ Historic places. At the time the conservation plan was written for the Brooklyn War Memorial we couldn’t find any further information out about the name Clover, who they were or what their connection was to the memorial. We did acknowledge the name in the plan but because we didn’t know exactly what they did, we couldn’t assume that they were the sculptor. Since then (2002), new information has been found referring to the name Clover. I understand that it talks about a stonemason who did work on memorials and graves, whether is specifically refers to the Brooklyn War Memorial I am not sure as I have not yet seen it. The conservation plan is due to be updated in 2012. I’m hoping we can use this new information to clarify whether Clover was the designer and/or sculptor and at this time we will update the plan accordingly. an interesting question! I have contacted the W.C.C. and have directed them to this blog – so they’ll be able to answer you directly via this blog. Does anybody know why the W.C.C. conservation plan (2002) states that the sculptor for the Brooklyn memorial is not known, when it is inscripted on the base (H. Clover). Besides the Chris McLean/Jock Phillips book on war memorials, Robin Morrison, Gary Blackman and Laurence Aberhart have made a point of photographing them. Blackman had an exhibition of war memorial photos at Exposures Gallery in 1985 (I think)called For God, King and Country: Memorials of War. There was a 2 page flyer I vaguely recall. Several examples of Blackman’s elliptical war memorial photos are held in Te Papa. One of Aberharts photos (Patea memorial)is on display in Toi Te Papa. Thanks Jamie. The Memorials Register is a fantastic resource and we hope that images of currently unphotographed memorials received in response to this project can also be added to the Register. We are happy to contribute photos to the Te Papa project and perhaps some of the Te Papa ones could be used to help fill up the memorials register. Just email info@nzhistory.net.nz for more information. Thanks, Pamela. I’ve added a caption now (it’s Brooklyn War Memorial). I hope you’ll be contributing a photo or two to the project! I think this is a great project for Te Papa to be doing! I’m inspired. Just wondering where the memorial in the picture is from? Great to hear! You can record where you’ve been (or where you plan to go) under the “Where’s My Memorial?” topic on the Flickr page. Can’t wait to see your photos! I just want to say I think this is a fantstic use of the museum weblog!!! Off to take some photos!